Let Elite Black Car take you in comfort and style to that big game you are waiting for. Sit back, relax, and enjoy your time. 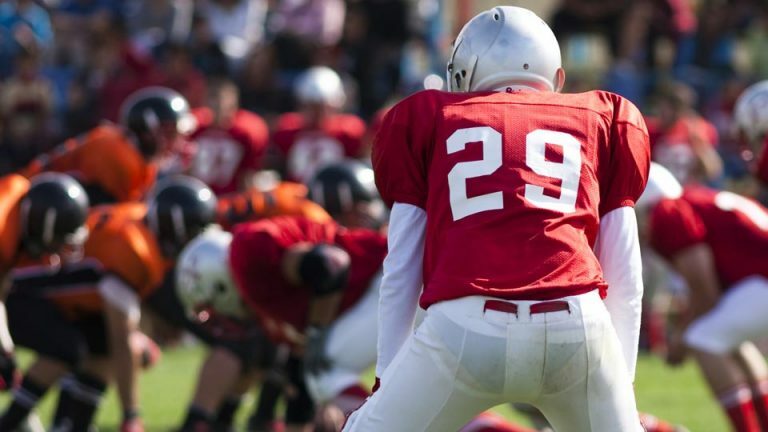 Let Elite Black Car take you to that big game. Sit back, relax, and enjoy your time. Southern California is certainly not lacking sporting events. Regardless of the sport, make the next competition, race, or match memorable. Elite Black Car Services provides sporting event transportation solutions in Los Angeles and Orange County. Let us take you to the pre-and-post event activities, like a dinner with friends before the big game or a night out afterward. Whether you need transportation for a small group or a whole team, we’ve got you covered! Elite Black Car Services caters to groups of all sizes. 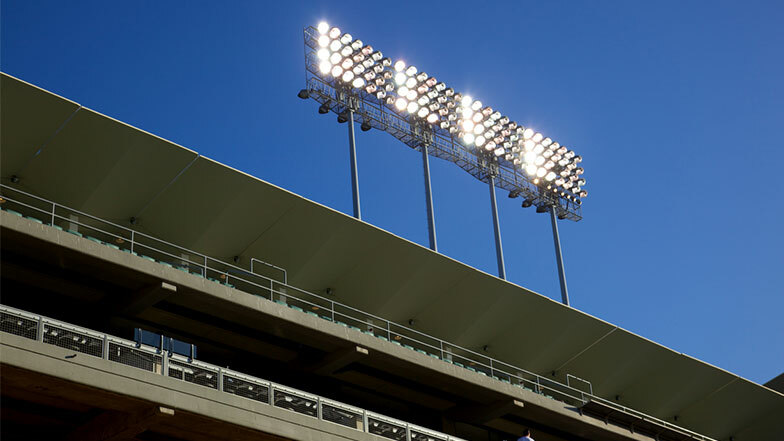 With an extensive fleet of well-maintained luxury vehicles, including sedans, SUVs, and sprinter vans, our team of professionals are here to meet all your sporting events transportation needs and take you to your destination worry free. Our friendly and reliable customer service assistants are available to help you choose the perfect vehicle to meet your transportation needs. We will help you plan your trip to the game, take the mystery out of what happens to your car with stack parking, or the hassle of trying to walk from a couple miles away. Our highly-trained professional chauffeurs are experienced and familiar with the area, so you don’t have to think about driving, finding a good parking spot, arriving late to the game, drinking, or getting back home. Book your trip with Elite Black Car Services, and make your outing unforgettable. Be prepared to relax and have fun with your team, your family, or friends. If you would like the convenience of having the driver wait on location, we offer hourly service. This way the driver will wait on location for the duration of the event, and you can be as early or as late as you wish. There is no need for you to notify your driver or dispatch about running late. An additional advantage of booking hourly service with us is you will have the same driver for the night, and you can leave your belongings in the vehicle. 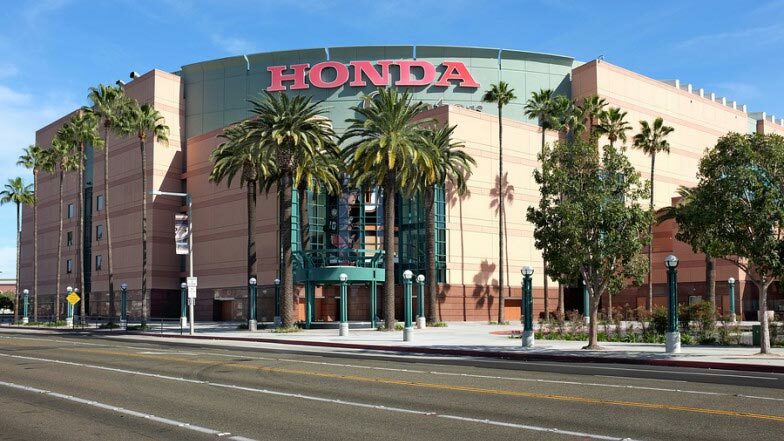 The Honda Center in Orange County is the sister venue of Staples Center in Los Angeles and is located near Angel Stadium of Anaheim. It is home to the NHL’s Anaheim Ducks and also hosts a variety of large concerts and other events, much like Staples Center. Depending on what type of event is being hosted there, the Honda Center seats nearly 19,000 people. With such a large capacity, parking at the Honda Center can be expensive or a very long walk because the lots near Honda Center become full. 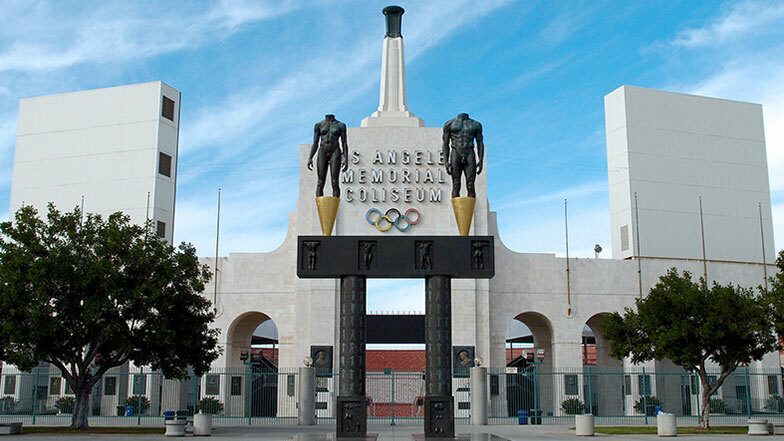 The Los Angeles Memorial Coliseum is an outdoor sports stadium located in the Exposition Park neighborhood of Los Angeles, California. The stadium serves as the home to the University of Southern California (USC) Trojans football team and as the temporary home of the Los Angeles Rams of the National Football League (NFL). With a seating capacity of over 93,000 and limited parking, getting into and out of a game at the Coliseum can take a long time. StubHub Center, formerly the Home Depot Center, is a multiple-use sports complex located on the campus of California State University, Dominguez Hills in Carson, California. 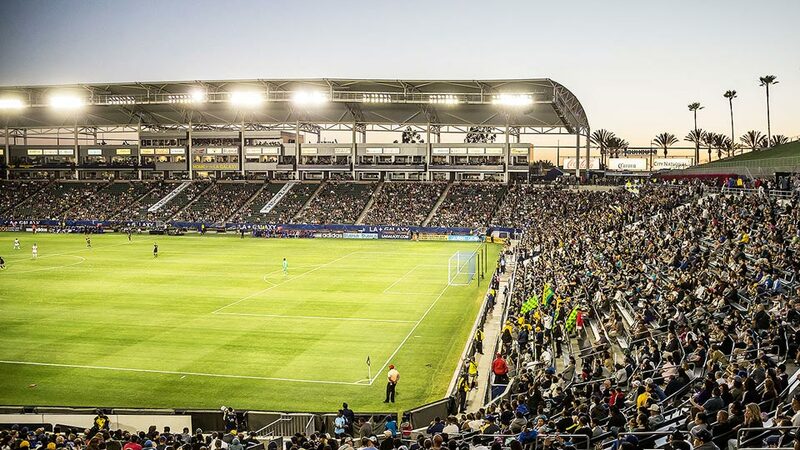 Approximately fourteen miles (23 km) south of Downtown Los Angeles, the StubHub Center is home to the LA Galaxy of Major League Soccer and the Los Angeles Chargers of the National Football League (NFL). With a capacity of 27,000, it is the second-largest soccer stadium in Major League Soccer. 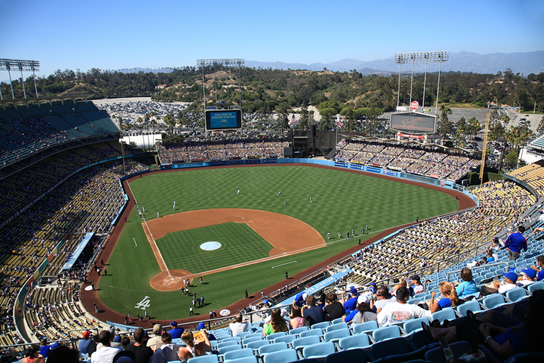 Dodger Stadium is a baseball park located in the Elysian Park neighborhood of Los Angeles, the home field of the Los Angeles Dodgers, the city’s Major League Baseball (MLB) franchise. Opened 56 years ago on April 10 and with 56,000 seats, this ballpark is has the largest seating capacity of all MLB venues. It is located next to the ever-busy downtown Los Angeles, so traffic to and from the stadium can get pretty bad. Angel Stadium and its surrounding parking lot are roughly bound by Katella Avenue to the north, the Orange Freeway to the east, Orangewood Avenue to the south, and State College Boulevard to the west. The Big A is also host to various Supercross, off-road racing events, and has a capacity of roughly 45,000. Staples Center, officially stylized as “STAPLES Center,” is a multi-purpose sports arena in Downtown Los Angeles. Adjacent to the L.A. Live development, it is located next to the Los Angeles Convention Center along Figueroa Street. The Staples Center is host to more than just Lakers games. The venue is home to the Lakers, Clippers and Kings, a slew of concerts, special events and more. 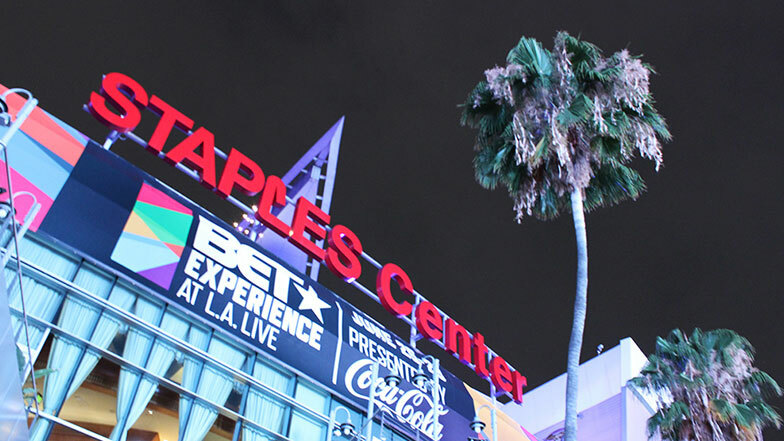 Given that the Staples Center is in the heart of Los Angeles, and with a maximum capacity of more than 19,000, parking, traffic, and getting in and out of the area can be a hassle. Count on our professional chauffeurs to navigate the area and get you to the venue with ease. The Rose Bowl is an outdoor athletic stadium, located in Pasadena, California- a northeast suburb of Los Angeles. One of the most famous stadiums in sporting history, the Rose Bowl is best known as a college football venue, specifically as the host of the annual Rose Bowl Game for which it is named. 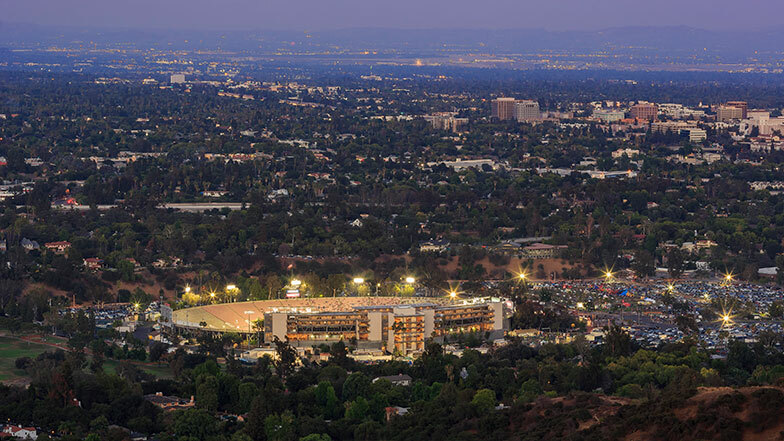 Since 1982, it has also served as the home stadium of the UCLA Bruins football team. We only provide transportation to the Rose Bowl as an hourly option, and you would pay for the parking inside the stadium. We cannot do a pickup from outside the Rose Bowl grounds, as we cannot get within a mile of the property after any event.